An electrified network will give passengers a world class service that is safer, environmentally friendly and efficient. To power the new electric trains, masts and overhead wires have been installed along more than 37km of the southern rail network between Adelaide and Seaford (including the Tonsley line). As with all rail networks, safety is paramount but it is important to remember you don’t need to do anything different to safely use an electrified system. There are however, some unique features of an electrified rail system that we would like you to be aware of. This includes screening or physical barriers which are placed between people and electrical infrastructure, such as overhead wires and fittings, and limiting access to the train corridor. The overhead wires along the railway lines between Seaford and Hallett Cove Beach were energised in June 2013, and between Hallett Cove Beach and Hove in November 2013. In January 2014, the remainder of the Seaford (formerly Noarlunga) line from Seaford to Adelaide Railway Station was ‘switched on’. On 2 May 2014 the Tonsley line was 'switched on' and on 3 May 2014 the Belair line was 'switched on' between Goodwood Station and Adelaide Railway Station. 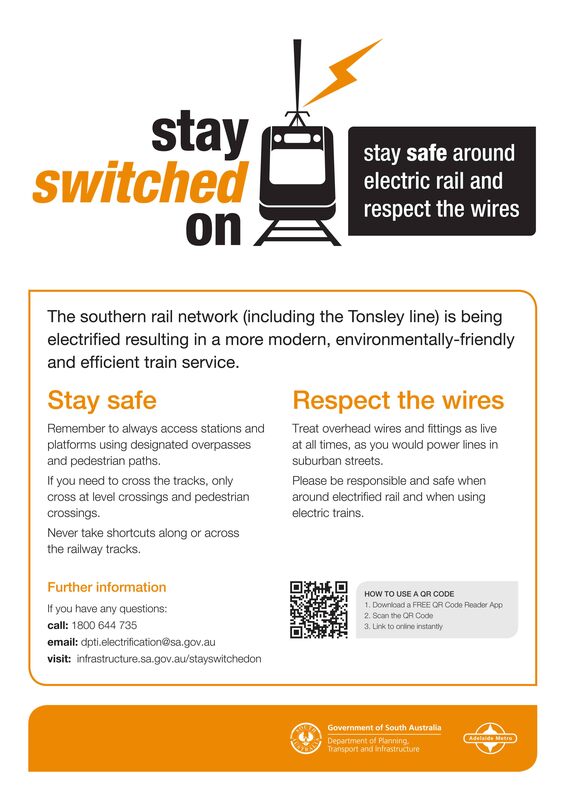 Overhead wires and attachments within the rail corridor on the Seaford line, the Tonsley line, and the Belair line from Goodwood Station to Adelaide are dangerous if interfered with, carrying 25,000 volts of electricity. Please 'stay switched on' and treat all wires within the rail corridor with the same respect you do with suburban power lines. As with all rail networks, safety is paramount and we appreciate your co-operation in helping us to keep everyone safe around our rail lines. 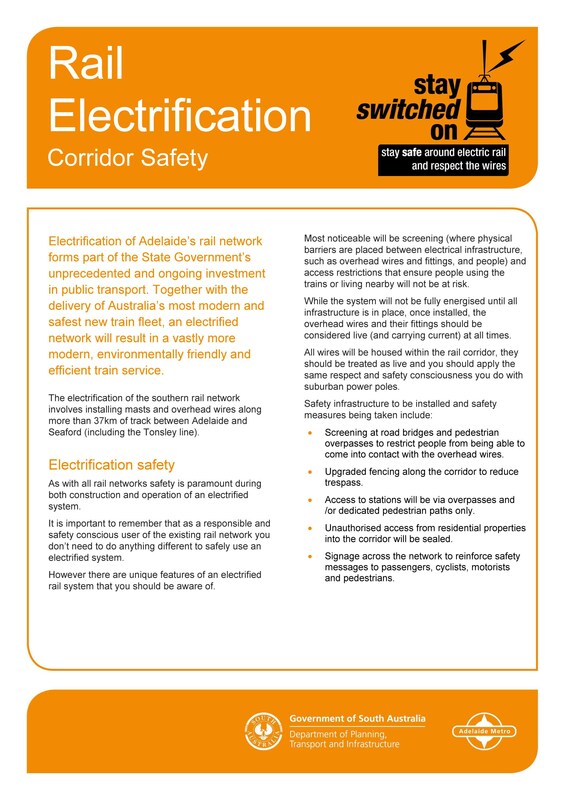 Download the Rail Electrification - Corridor Safety factsheet or Stay Switched On poster for information on how to be safe around electrified rail and to display at your workplace or school. 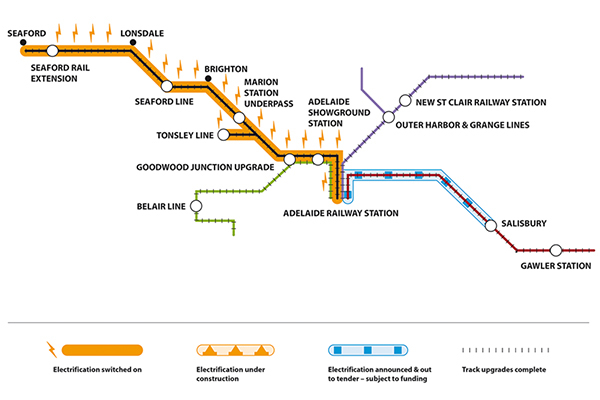 For more information about electrification of Adelaide's train network please visit our rail electrification website.